In 2005, as part of its research activities in the field of investment treaty law and arbitration, the Investment Treaty Forum at the British Institute of International and Comparative Law organized two very successful public conferences in London addressing the issues of 'Nationality and Investment Treaty Claims' and 'Fair and Equitable Treatment in Investment Treaty Law'. The first conference addressed a central issue in international law. Nationality sits at the heart of the debate over the rights and participation of private parties in international relations. In international investment law, nationality constitutes one of the central criteria defining the scope of application of international investment agreements such as the ICSID Convention or the several thousand bilateral investment treaties (BITs) and free trade agreements (FTAs). It is a very complex and sensitive topic as the debate following the 1970 International Court of Justice decision in Barcelona Traction amply demonstrates. Topics addressed at the conference include the issue of nationality of physical and legal persons, the requirements for substantive and continuous nationality, as well as the issue of nationality in derivative actions and indirect claims. The second conference dealt with potentially the most important and elusive obligation imposed on States by international investment treaties: the fair and equitable treatment standard. The elements that are usually cited by the case law and by legal scholars in the attempt to describe the meaning of the fair and equitable treatment standard include very broad concepts that are open to differing interpretations depending fundamentally on the perceived objectives of the international investment system. 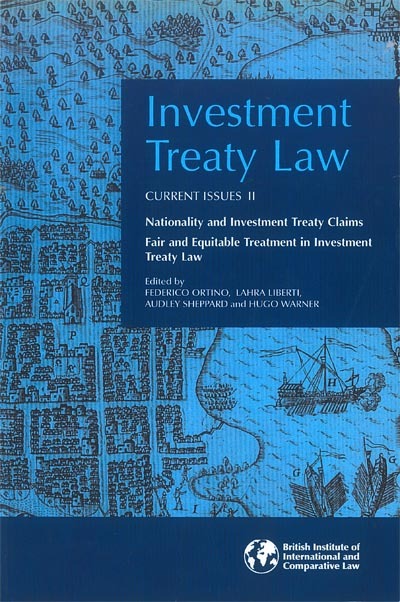 "Investment Treaty Law: Current Issues II"